Home Secretary Theresa May has defended the collection of vast amounts of phone and internet data - as exposed by US whistleblower Edward Snowden. "If you are searching for the needle in the haystack, you have to have a haystack in the first place," she said. She told a Parliamentary committee citizens did not give their explicit consent to have their data harvested by the security services. But there was an "unwritten agreement" that it was needed to "keep us safe". 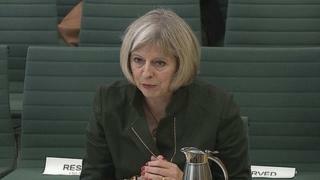 Mrs May argued that collecting and storing phone and internet records was not the same as "mass surveillance" because "most of the data will not be looked at at all, will not be touched". But she added that there was "a necessity in having the material in order to be able to search it in a very targeted way" and it was "hugely important" to have "large amounts" of it. "The ability to interrogate that bulk data - to look for that needle in the haystack - is an important part of the processes that people go through in order to keep us safe," she told the intelligence and security committee. This puts the home secretary directly at odds with civil liberties groups, who have told the committee that bulk collection of data is a gross invasion of privacy which should be banned. "I don't the very collection of bulk data itself is an invasion of privacy," she said, adding that she believed privacy considerations only should only kick in "at the point at which the communication is opened". She said commercial companies also collected large quantities of data to target advertising at consumers. Labour MP George Howarth pointed out that internet users normally consented to this, even if they did not always read the "terms and conditions". Mrs May replied: "I think there is - not a contract entered into - but an unwritten agreement between the individual and the state that the state is going to do everything they can to keep them safe and secure." She said there was a clear difference between examining data - the time and location of phone calls, for example - and snooping on the contents of calls and emails. And she revealed that the task which took up more of her time than any other at the Home Office was considering applications from the police and security services to bug the phones of suspected terrorists and organised criminals, or mount surveillance operations. The number of warrants she refused to sign was "very, very small," she told the committee, but added "any warrant that reaches my desk has been through a very thorough process". She said there was a need to educate the public about why bulk data collection was needed - but she ruled out publishing statistics comparing the effectiveness of that technique at foiling terrorist attacks with targeted surveillance techniques such as phone taps. She also categorically ruled out scrapping the convention dictating that ministers never comment on security matters. The committee of seven MPs and two peers is investigating whether surveillance laws need to be updated in light of Snowden's leaks suggesting wholesale interception by GCHQ of internet traffic passing through the UK.